Although born in Loudovice, Bohemia, now Lounovice pod Blanikem, Czech Republic, Jan Dismas Zelenka will always be associated with the golden age of Dresden in the late seventeenth and early eighteenth centuries. During this period Dresden was known as the cultural and musical capital of Europe, earning the city the nickname ‘The Florence of the North’. It was during this period that it was able to attract the best of musicians. These included Pisendel, a fine composer and an exceptional violinist, as well as the greatest composers of the day such as Vivaldi, J. F. Fasch, Telemann, Heinichen, Quantz, W. F. Bach and Hasse all composing for the Court Orchestra. Zelenka rose through the ranks from a lowly gamba player to the position of Kirchencompositeur or church composer. His music is finally commanding the recognition it deserves, mainly due to companies such as Carus, Supraphon and Passacaille, who have done a great deal for the rehabilitation of his music. One only has to listen to his wonderful Miserere to be smitten by his music. The eight Italienische Arien formed a kind of musical application to Frederick Augustus II, the then new ruler of Saxony, for the position of Kapellmeister. This had been vacant since the death of Heinichen but the position eventually went to Johann Adolf Hasse. The excellent notes with this CD suggest that the choice of Hasse was mainly down to his reputation as a composer of Italian opera. Zelenka had never composed an opera before. This points to the direction that music in the Court was heading. The eight arias, whilst being attractive and full of compositional artistry, according to the notes, “display slight weaknesses in the setting of the text”. They could be said to be over-long, with some of them being nearly double the length of a normal Italian baroque opera aria. The main problem is that they probably seemed at the time a bit old-fashioned and outmoded. Don’t let this put you off as they are certainly full of interest and imagination. As to the performance, this is a well suited trio of singers with none of them suffering from the affectations of the later Italian style of opera singing. 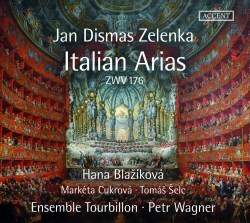 Hana Blažiková is the real star on this CD. Her perfectly clear soprano voice lets the music shine, whilst Markéta Cukrová’s pure alto is lovely and Tomáš Šelc is quite a heroic bass. The singers are expertly supported by Petr Wagner and his Ensemble Tourbillon whose contribution to this disc should not be overlooked. They are all captured in a pleasing and clear acoustic which helps to bring out the best of this wonderful music.